On the same day I wrote about the first Peppercorn Bracelet, my mom sent me an email asking me to make one for her too. My Mom’s absolutely awesome so she went to the top of the list. 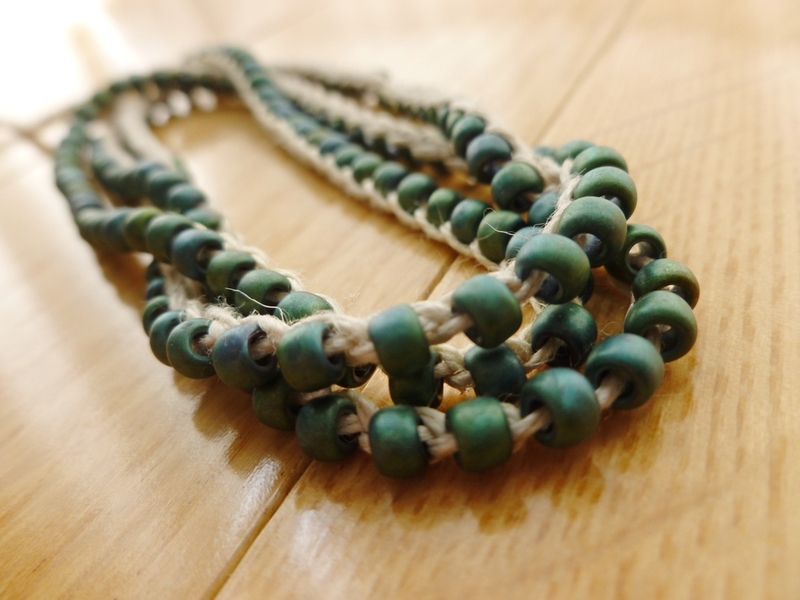 When I was out and about searching for yarn, I found the perfect bronze-colored glass beads in a yarn shop. A good trip. This Peppercorn Bracelet worked up even faster than the first. Using the recommended number of beads will do that. The second reason was because I switched to a crochet hook instead of using double pointed needles. Working fine hemp cord with the DPN’s was hard on the fingers. The needles poked holes in my skin and left my finger tips sore. Using a crochet hook made the whole process pain free and wonderfully fast. I was able to finish the whole bracelet in an afternoon instead of having to space the work out over several days. After making two of these, especially from hemp, I can tell you that there is one step that absolutely can not be skipped - blocking. When the bracelet is fresh off the needles or the hook, it’s going to twist and curl up on itself. It won’t lay or hang well and it certainly won’t look its best. The one minute it takes to block the piece is well worth it. Put the bracelet under water just long enough to get it wet. Tug the ends a few times to straighten it out and hang the bracelet up to dry. That’s it. 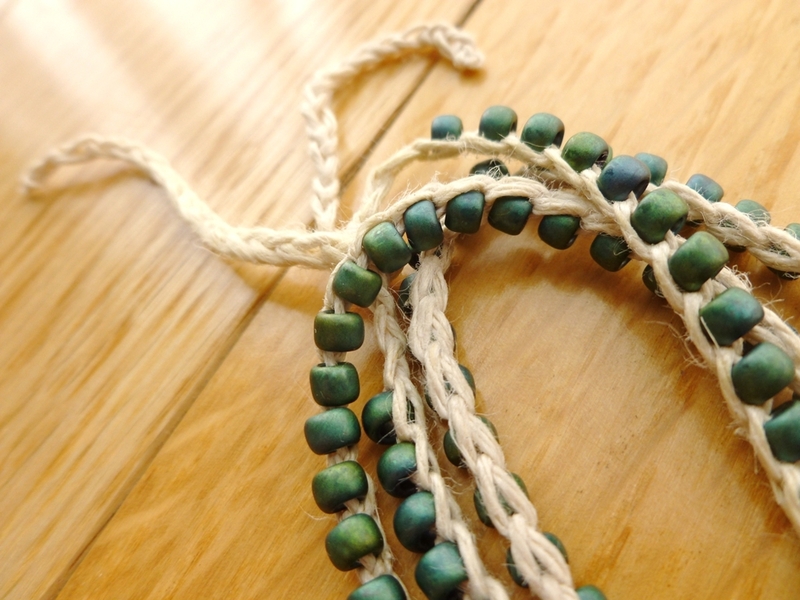 In a perfect world, I’d be writing about how I cast on for the Peppercorn Bracelet as soon as the beads and the cord were in hand. The pattern photos are lovely. 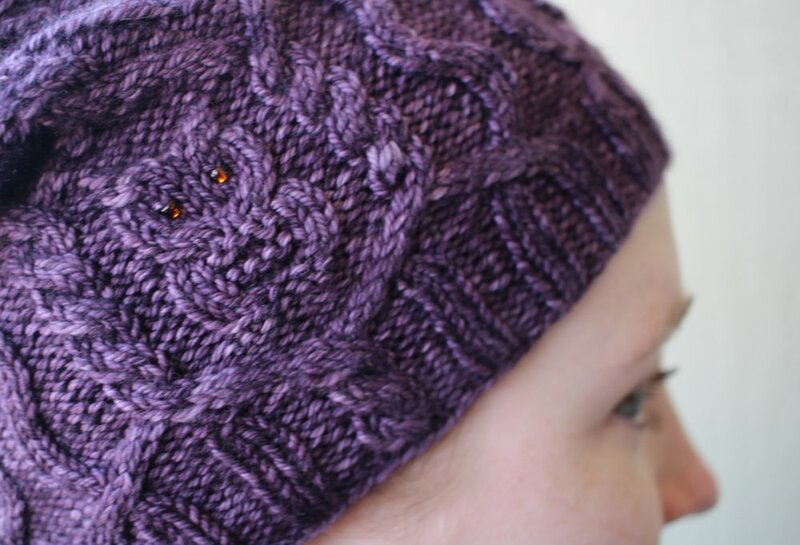 All the projects on Ravelry are very complimentary. However, I strung the beads in January and then the whole thing sat on a shelf until I was infected by sudden fit of reorganization. Finally knitting the bracelet seemed like a much better idea than stuffing it into a bag and forgetting about it for another month or two. Glad I did. Over the next few days, I knit on it at least 5 beads at a time. The hemp cord I subbed in for yarn was a bit hard on the hands and not just because it lacked any stretch. I was poking holes in my fingers trying to get one stitch over the other. The finished bracelet is definitely worth the effort though because I love wearing it. It’s dangly and the hemp cord has a nice drape. Even better, the bracelet’s extra long since I used every bead I had. Why let the extras take up space on that shelf I was trying to reorganize? Made the end ties longer too so it sits at the perfect spot on my wrist. I like wearing this bracelet so much that I’m definitely going to make more as gifts. They don’t take much cord/yarn, I get to play with pretty beads, and my friends get a nice bracelet. Everyone wins. I’m a big fan of taking a break when necessary. Complicated problems, finicky questions, and pesky knitting designs can be hard to solve in one sitting. Instead of beating my head against the same spot on the wall, I go for a walk, play a game, and do my best to simply ignore the damn thing for awhile. It’s better to come back with a fresh mind and make time for the flash of inspiration to strike. The current pesky problem? My latest work-in-progress design. Things were doing so well too. My swatches were truthful and I had enough yarn; the only thing left to do was cast on. 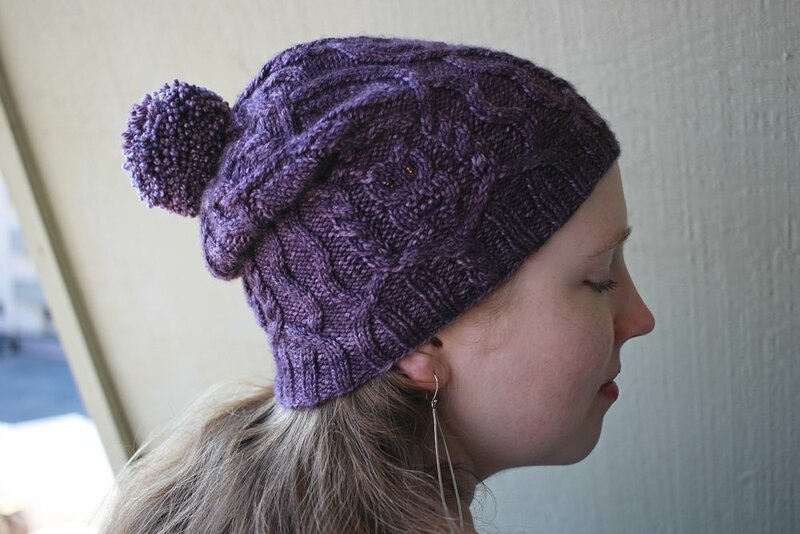 Several thousand stitches later, a tiny detail about knitting in the round threw the whole project for a loop. The only thing to do, besides from rip it all out, was to do something else. Enter the Peppercorn Bracelet by Kourtney Robinson. I picked up the supplies for it last month and last weekend seemed like the perfect time to get started. My only mod is to use fine hemp cord instead of yarn. By the way, collapsable eye needles for stringing beads are definitely worth the money. The weekend away and a little mindless knitting seems to have done the trick. I have an easy, wonderful solution and the pattern is back on track. Still have to rip out the first attempt though. Send reinforcements.